The school was founded in 1922 as Primary school and upgraded to Middle school in 1950. School came to exist as high school in 1959 and inaugurated by Dr. Y.S. Parmar, Chief Minister of Himachal Pradesh on 25th October 1965. 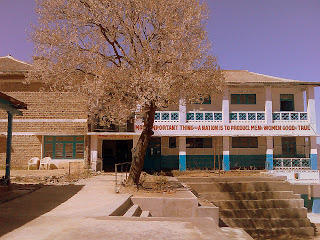 School was upgraded to Senior Secondary School in 1996 inaugurated by Sh. Jai Bihari Lal Khachai, PWD Minister and Sh. Krishan Datt Sultanpuri, M.P. presides over the ceremony on 24th June 1996. INDER SINGH NEGI, GIRJA NAND, PREM SWAROOP SHARMA, P.L. SHARMA, SANDEEP SHAUTHA, B.L.GUPTA, BRIJ MOHAN NATH,BANSI LAL, S.K.MEHTA. SUKESH SHARMA (offg), M.Y.ANSARI, TRIVENI BHARDWAJ (offg), S.M. SONDHI, D.R. MEHTA (offg). A website should have all kind of information of the concern institute. You can develop management system along with your website. Online Time table of each class, Teacher's time table, online homework to students, online sitting plan in examination, online attendence of students and teachers, online updation of marks of continuous evaluation, online massages to students and teachers and many more features can be added in management system and it really makes your education system nearly 100% transparent. Congratulations on launching a school website. This shows the visionary and dynamic attitude of school staff. It does'nt matter where you are working, its your positive and constructive attitude which makes the things done. The website will give good opportunity to faculty members and the students to express themselves and explore new information. The students, especially of rural areas, shall be exposed globaly which wil definitely result in the better development of their personality. Congratulation for having your own website. It will help the parents as well as local public to check the over all progress of the school, i.e. its results ,others achievement in all other fields.